Sathu Maavu/Multigrain Health Mix/Home made cerelac is one regular food in my daily routine. I begin my mornings with this drink and I prefer making roti or dosa twice a week with this so that it gets included in my little one’s diet too. I somehow have not experimented giving him this as a porridge to him because it is always recommended to stop offering porridges as regular meals above 8 months for babies. This dosa recipe was an instant try and it really turned out good in taste. You can realise the struggle I had in making perfect dosa with the images. Yeah.. Some extra care and patience is required to make this dosa without tearing into pieces.You shall definitely master the skill on your second trial itself for sure. This recipe will be an excellent choice in terms of nutrition and less effort. There is no need to grind or ferment batter to make this dosa.I kindly request you to please read the P.S section for more details. Yesterday I had posted home-made sathu maavu mix recipe. Now I am here with the procedure to make the porridge. This is the sweet version. 1.Add palm jaggery,health mix and water without any lumps. 2.Cook by continuously stirring for 10 minutes in medium flame. 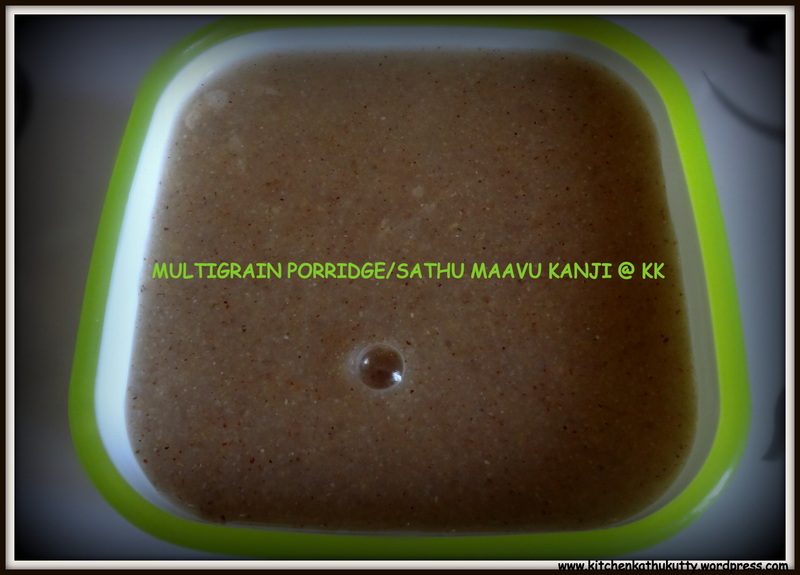 How to make sathu maavu/multigrain porridge at home? When you try for the first time try with half tbsp of mix. To add milk/buttermilk initially cook it with half water and then add milk/buttermilk. You can add karupaati/jaggery/salt instead of palm jaggery. You should cook minimum 10 minutes and you can cook more if you want a thickened version. Avoid any sweetner for babies less than 1 year. Wash and rinse Samba wheat for atleast 3 times. Soak it in water for 8 hours. Drain the water and grind wheat in a mixer jar by adding little water. Filter the extract. It will typically resemble milk. Keep extracting it until 3 times. Filter the milk for a minimum for 6 times. Add tastener as per your preference and transfer it into a cooking vessel. Cook it in slow flame by continuously stirring. The milk will thicken and become like jelly. Add a drop of ghee and cool it before serving your little one. 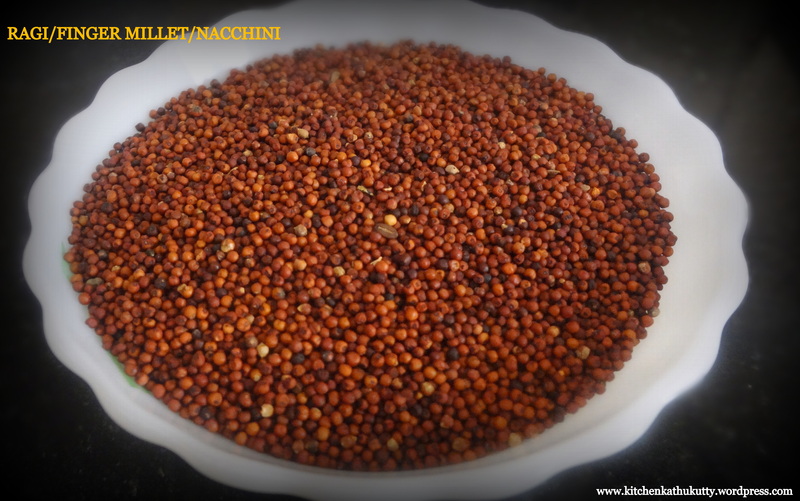 Ragi can be as wonder grain as it is the most nutritive one among all grains. It is the richest source of calcium and many other nutrients.Ragi is one of the first baby foods . But when I wanted to start with Ragi for my son, we were scared to use the ragi mix due to the presence of husk despite several times of filtering. That’s when my wonderful friends Sweatha Ravi and Pradepa Marappan guided me with this method.This food can be given after 7 th month completion. The below picture does not show the final stage of the porridge. Wash fresh ragi by rubbing with your hands inflowing water to get rid of all impurities. To clean away all husk and dirt do this for 3 to 5 times. Soak it in fresh water overnight or in hot water for 4 hours. In the morning or after 4 hours , drain the water and add the soaked ragi to a blender. Add quarter cup of warm water and run the mixer. Strain the blended ragi using a cloth or filter. You can get a liquid which resembles milk. Add water for 3 more times and extract the liquid/milk. Squeeze with your clean hands to ensure that the milk is completely extracted. Strain again and remove impurities. Discard the blended ragi and add the extracted liquid/milk to a sauce pan. Begin to cook by continuous stirring. The porridge will thicken and the raw smell will vanish. At this stage , switch off the stove. Cool and serve immediately to your baby. On cooking the porridge will soon become like jelly. So add water and dilute it. Filtering repeatedly is very essential in this recipe. Add ghee to the porridge when its hot. Don’t store this and provide your baby if its too thick. When you try for the first time add 2 spoons and begin. This can be given from 6 months. Always have a word with your doctor before introducing any new food to your baby. How to make rice porridge/arisi kanji for babies? The below post will give you five varieties of porridge to be given for babies with the set of porridge mix I have mentioned already. Take one tbsp of rice porridge mix. Mix it well with 1 cup of water in a mixing bowl . Ensure there are no lumps. Pour this mixture in a cooking vessel. Switch on the stove and place the vessel. Start cooking by slowly stirring. Add a tsp of pure ghee. On continual stirring and cooking, the porridge will get cooked and thickened. Cool it and feed it to the baby. Take one tbsp of rice porridge mix and 1/2 tbsp of fried bengal gram mix/green gram mix/urad dhal mix or 1/3 tbsp of ragi mix. Mix it well with 1 and 1/2 cups of water in a mixing bowl . Ensure there are no lumps. On continual stirring and cooking for around 10 minutes, the porridge will get cooked and thickened. The thickness of the porridge depends on the age of the baby. Add water accordingly. Cook it in medium flame. You can store this porridge in a dry vessel for a maximum of 3 hours and use it. Do not prepare large amount of porridge mix and store. Prepare it atleast once in 15 days. This can be the first food recommended for weaning as rice is easy to digest and does not result in complications most of the times.Start with plain rice porridge for around 5 days and start the next variation on 6 th day.So by around 25 th day you will be introducing ragi mix along with rice. Once all varieties of above said porridge has been introduced,you can alternate among these varieties in a day’s food chart . This will help in avoiding boredom to the baby and also will ensure variety and balance in the nutrition levels. I would suggest this as first food for babies rather than preferring few of the packed food mix available in market. Consult your baby’s doctor before introducing any food. Consider all family history of allergies while weaning. Stop a food and consult doctor in case of any misleading reactions to the food. Rice porridge might lead to constipation in few babies. Ragi introduction might tighten stools. In such a case reduce the quantity/frequency.